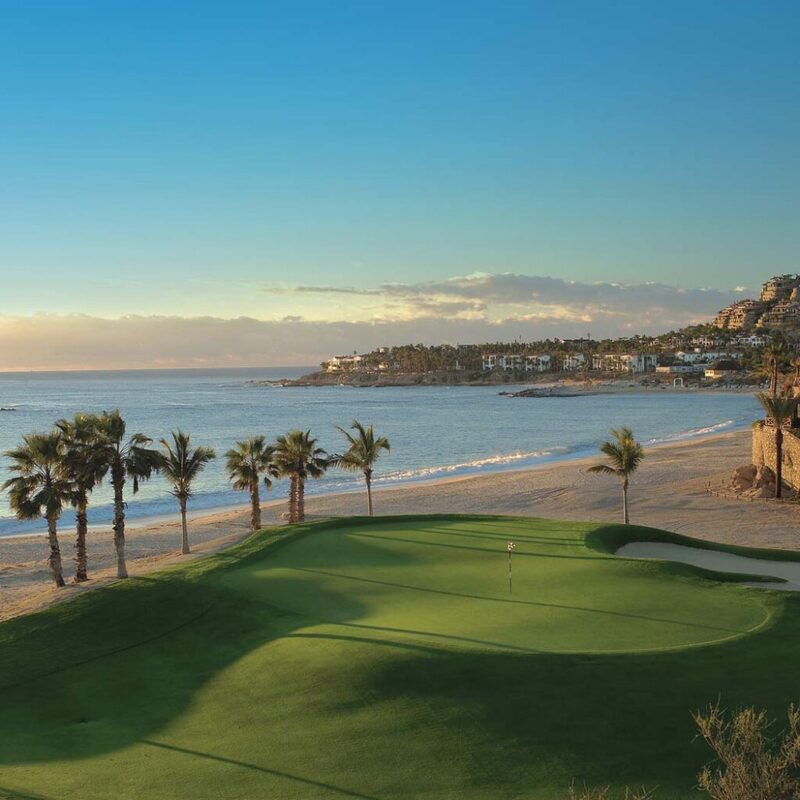 Opened in 1992 and the first Jack Nicklaus Signature Golf Course design built in Latin America, Palmilla Golf Club, the “Grande Dame of Los Cabos Golf,” is celebrating its 25th anniversary this year. A vanguard facility that set the stage for upscale golf development in Los Cabos, Palmilla’s core 18—the original Mountain and Arroyo nines—was the first course in the hemisphere to take full advantage of the region’s unique mountain, desert and ocean ecosystems. This trio of elements, along with Cabo’s consistently sunny weather, sparked the imagination of developers and gave rise to future projects in Los Cabos. The golf club, which has a membership and accepts daily-fee play, is a prime amenity for guests of One&Only Palmilla, a legendary resort built in 1956 by the son of a former president of Mexico. Chiseled into a box-shaped canyon and framed by tall, stony peaks on the outskirts of San Jose del Cabo, a colonial city of the 1730s, Palmilla presents a target-style test stretched across a desert plateau. Holes skirt canyon-like gulches, cactus-studded hills and boulder-strewn arroyos. An upland spread with sweeping ocean views, the layout is framed by multiarmed cardon cacti—a cousin of the saguaro, only taller—as well as desert trees and smaller cacti. Several holes call for heroic carries over no-man’s-land from the back tees, but broad terraced fairways, generous bail-out areas, and open-entry greens accommodate players of lesser attainment. Five sets of tees provide admirable versatility and strategic nuance. The club’s Ocean nine, added by Nicklaus in 1999, features a 600-foot elevation change from the first tee to the sixth green, transporting players from the mountains to the sea. Badly damaged by Hurricane Odile in September 2014, Palmilla reopened the following April following an extensive $3.5 million clean-up and refurbishment. The club used the post-storm closure to refresh the entire facility. The computerized irrigation system, golf cart fleet, course maintenance equipment and outbuildings were upgraded or replaced. Bunkers were refilled with sand; irrigation lakes were restored; and all playing surfaces, including tees, greens and fairways, were reconditioned. In addition to the remedial work performed on the golf course, Palmilla’s hacienda-style clubhouse was completely redesigned, with a new check-in area and additional retail space added to the wood-paneled golf shop. Like the golf course, the iconic One&Only Palmilla took a hit from Hurricane Odile and reopened in April 2015 after a major refurbishment. Originally known as the Hotel Palmilla, the resort was patronized in the 1950s by famous deep-sea fishermen, including John Wayne, Bing Crosby, Ernest Hemingway and Dwight D. Eisenhower. The hotel was later transformed by South African entrepreneur Sol Kerzner into a world-class resort. Then, as now, this elite retreat, a favorite of Hollywood A-listers, was set on a rocky promontory that juts into the azure-blue sea. The resort’s sandy beach is one of the few in Los Cabos where the water is calm enough for swimming. Nicklaus, known as the “Golden Amigo” for his role in spearheading the growth of golf in Los Cabos with his prolific output, returned to build five additional layouts at the tip of the Baja Peninsula after the 1992 debut of Palmilla. Yet this idyllic 27-hole facility celebrates its silver anniversary as the queen of Cabo’s golf courses.